Woo Hoo! Easy Rewards Points! Did you notice that all these programs require some sort of easy action on our parts? Shopping ‘Dollars’, Gas Points, Air Miles; whatever the program there are free goods that come with the rewards. Or are they... free, that is? Don’t forget that we have to hand out our hard earned dollars to get those prizes. I was at my regular Thursday night bible study when the pastor told us a story about a man he knew who prayed for God to not let him get drunk anymore. The problem was he kept on going to the bar and drinking; because he liked it. This man didn’t want to put in his share of the work to get the results he claimed he wanted. I often wonder about this verse. Jesus said to him, Get up! Pick up your bed (sleeping pad) and walk! (John 5:8, AMP) This guy just doesn’t get it! Jesus has to tell him to (a) get up, (b) pick up his bed and (c) to walk. Let’s ask ourselves this question today. Am I waiting for direction, even when I know what I am supposed to do? In case you forgot… (a) get up, (b) pick up your bed and (c) walk. I realized I have been doing the same thing. I’ve wanted blessings from God without doing my part. I want a husband, money, and other things. I’ve gained back some of the weight I lost in the last year or so. 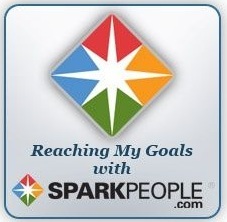 I want to lose weight again, and didn’t want to get back into the SparkPeople healthy living program. I even tried Green Coffee diet pills (the latest fad)! As I should have expected, they didn’t work. If I want the benefits, I have to do the work! Getting back into healthy eating and exercise is what it takes if I want to be thin and healthy. God wants to bless us, but we have to do our part. He gave us free will for a reason. He can hand us blessings but we have to want to reach out and take them. He won’t clobber you over the head and make you take His gifts. Jesus died for our sins, but unless you decide you believe it and want the gift, it won’t do you any good. I couldn’t help but wonder... where else in my life have I wanted to reap the rewards without putting in my share of the work? ~~ Dear God ~~ You are so loving and giving. So often I forget how loving You are. Thank You for all the blessings that You have given me, and have in store for me. Please help me to remember that I have to do my share of the work, and reach out to You with a loving heart if I want the rewards. In Jesus name, AMEN. Thank you so much! I was very inspired by God's word! It is so true that sometimes we get lost in our routine that we forget we can't just be like robots and expect God to do all the work! We have to set goals and work towards those goals! Amen! What an interesting way to teach the point! I shall remember this valuable lesson! I found that things work out like God wants and in his time God can say no God is not our servant to meet our needs We are to serve him. A word in due season. I read this and was blessed again by your writing Carley! You are on a roll! I will try to respond with a little more detail soon! Thanks for sharing!!! For some reason this got me to musing about my first marriage (which was never consummated). He was an alcoholic and had several psychological problems. He was also a Christian, and was kind in general. After being with him for 7 years, we tried going to counseling but he wasn't really interested in participating. That is when I decided that I should divorce him (technically I could have had it annulled, but my lawyer felt it would be difficult to convince the judge I had stuck around that long for an unconsummated marriage). What I wanted out of marriage was love and children, but what he wanted was a substitute mommy. I too am guilty of taking those green tee pills. My husband bought them for himself, but when he didn't take them, I thought I would give them a try. And just as I thought, they did not work. I think we're all guilty at one point or another to want results without doing the work. Our responsibility, after we realize it, is to change our ways. That was just what I needed Carley. Now to get up take up my (thing), and walk!!! Thanks, that was so wonderful to read! You know sometimes we tend to ask God why when something bad happens. If only we would use his guide book to begin with we would have had his blessings (rewards,, up front). Your blog reminded me of the story of a person who went to Heaven and was shown this room full of beautiful decorated presents that went to the ceiling. Upon inquiry that person found out that these were blessings never claimed on earth. Keep on blogging my friend. You have great God-given talent. You know, Lois, you are right. We probably don't even realize how many unclaimed blessings we have. There, for us. All we have to do is claim them. Thanks. And thanks Carley for your beautiful blog. Have a wonderful day. May God be glorified through all we have to give in this life! And when we fall short (and mankind has and will), may be sincerely repent, forgive, know that we are forgiven, and move on to the great example we have in Jesus Christ. I am blessed richly and so look forward to our eternal and heavenly rewards. Carley I loved your blog. So true. We do have to accept the idea that it will take work on our part to reach our goals and maintain them. So often, like you say, we want the rewards without the work. Nothing worth having is free, I have noticed. Thank you . I'm glad you enjoyed it. Many blessings to you. I understand what you are talking about in re: to 'writers block'. I pray the Dr. will find the right meds for you! Thank you very much for the prayers. Many blessings to you. Writers Block or Spiritual Block?